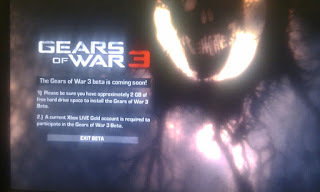 Ok today I will be releasing the Gears Of War 3 Beta which is of course not out yet but when you download this beta and add it to your usb or hard drive then what will happened you will be able to download it when everyone else who bought the bulletstorm game and got the code so you are saving yourself around £40. the same steps should be taken as in the how to download mw2 with non flashed console video tutorial so just watch it again its very easy. this is how it looks when you have downloaded it and transferred it onto the xbox and pressed play.